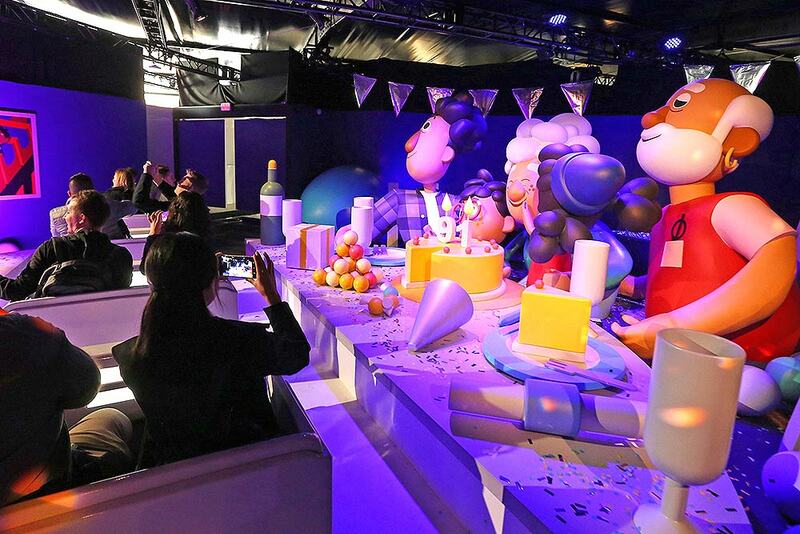 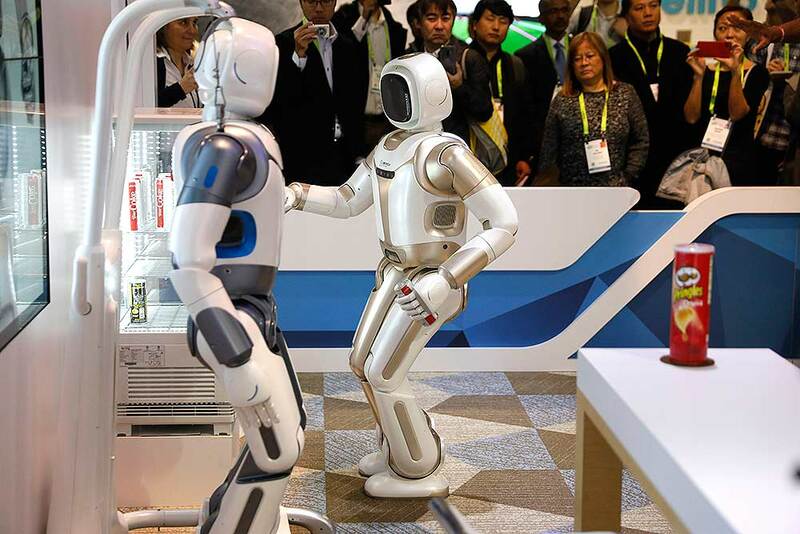 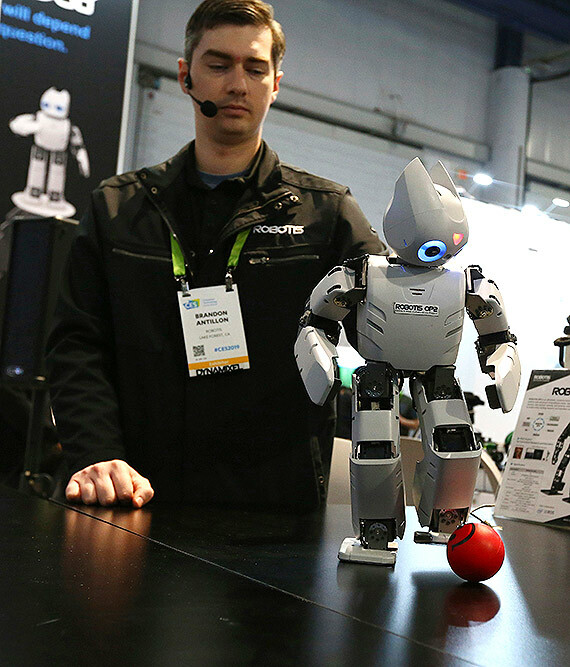 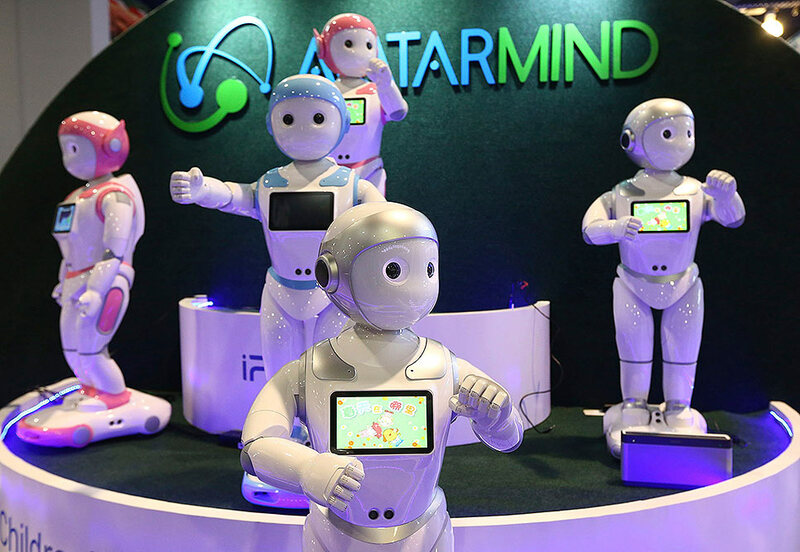 AvatarMind has developed service robots like iPal which is based on artificial intelligence, motion control, sensors and power management, and created iPal to deliver on that vision with multiple applications for friendly, fun and functional robot assistants, shown at CES International in Las Vegas. 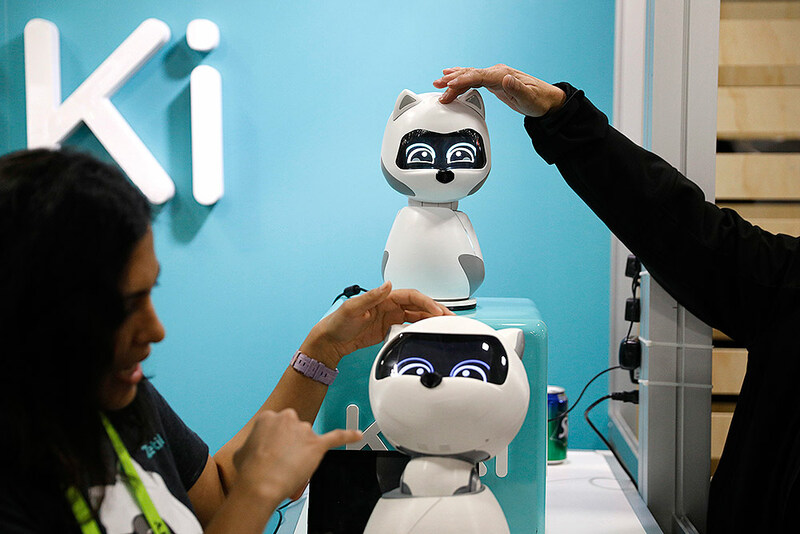 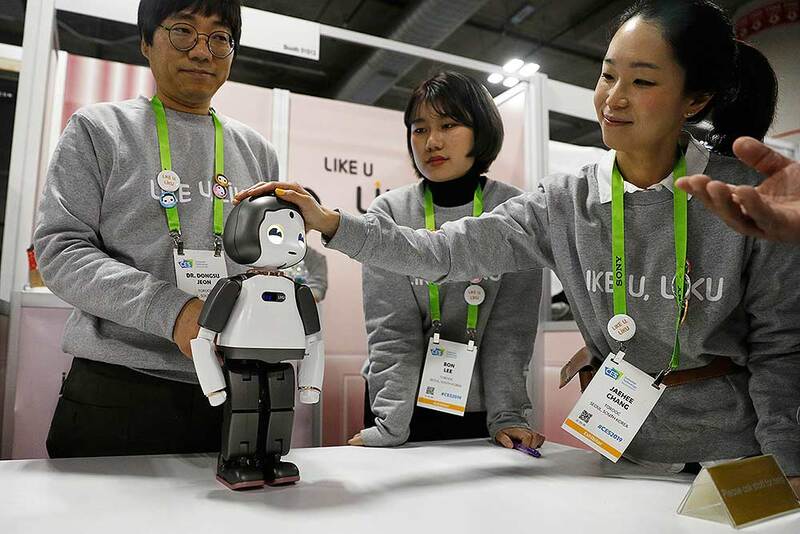 Designed for child education and elder care, iPal is a fully functional humanoid robot with a friendly, playful demeanor, as iPal runs on the Android operating system with extensions for motion, sensor and natural language conversation. 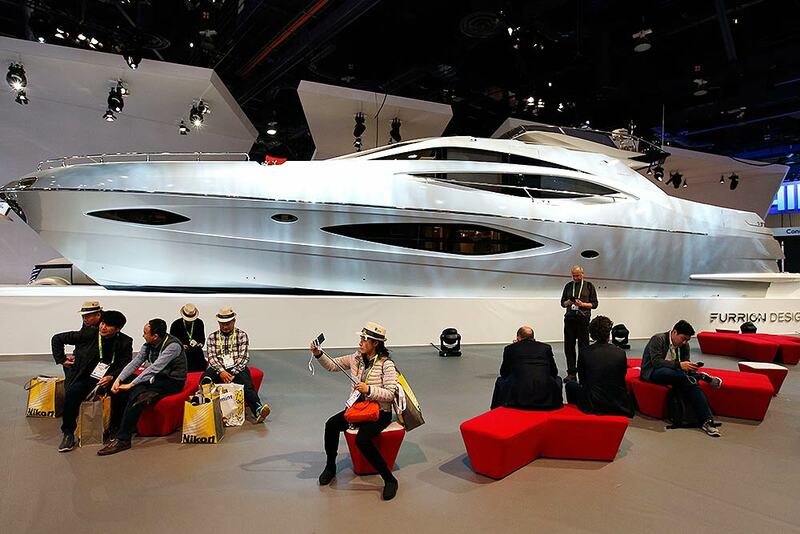 People sit around the Furrion Adonis concept yacht in the Furrion booth at CES International, in Las Vegas. 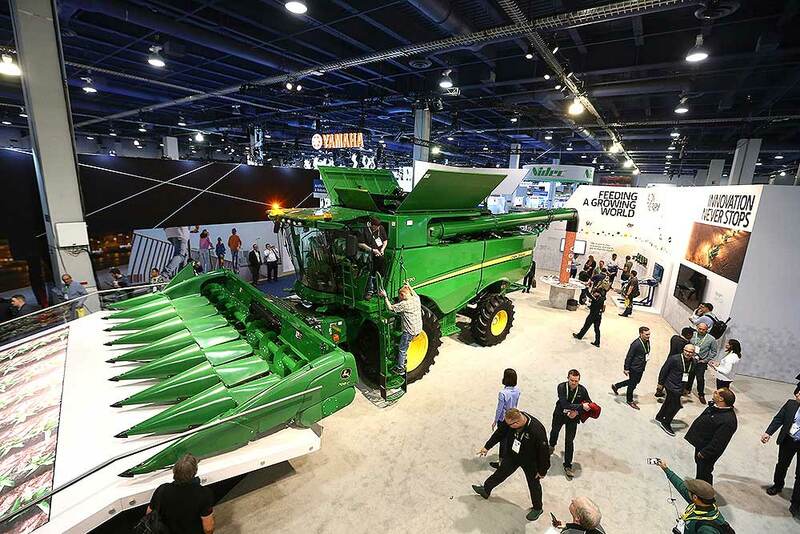 John Deere has hauled in a 20-ton combine harvester aided by artificial intelligence, while the combine has cameras with computer-vision technology to track the quality of grain coming into the machine so that its kernel-separating settings can be adjusted automatically, as farmers can monitor it remotely using a smartphone app, shown at CES International in Las Vegas. 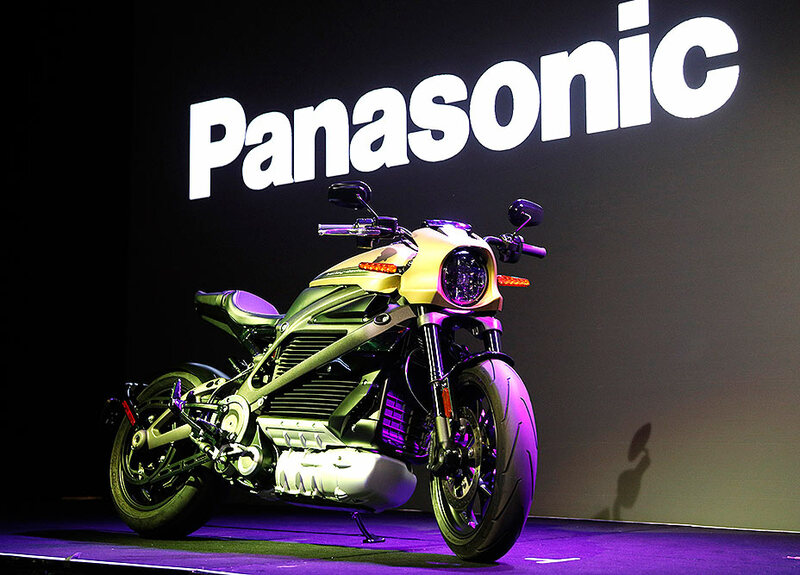 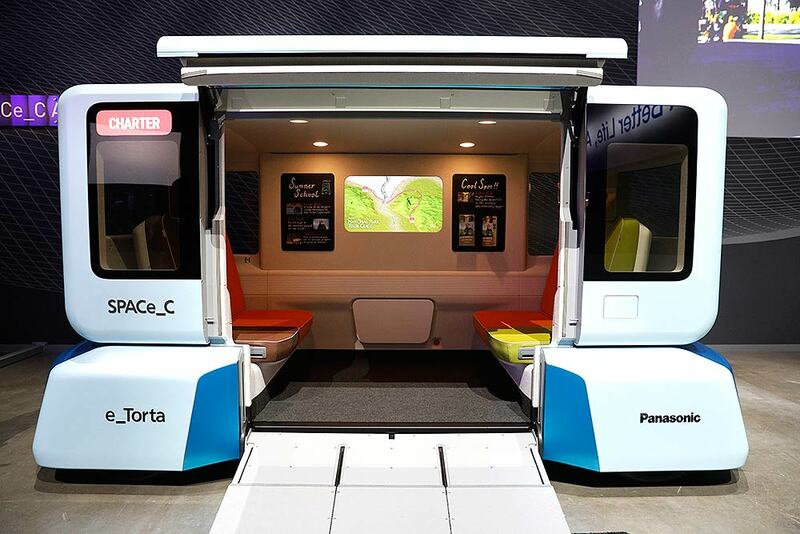 The SPACe_C scalable emobility concept is on display at the Panasonic booth at CES International, in Las Vegas. 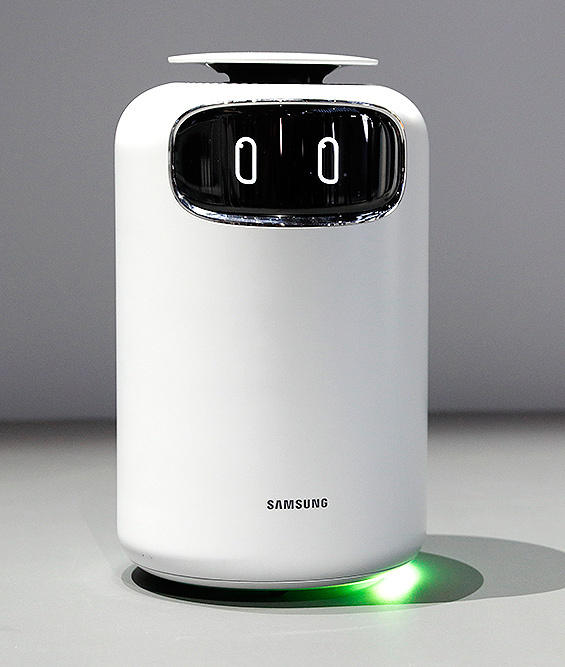 The Bot Air air filtering robot is displayed in the Samsung booth at CES International, in Las Vegas. 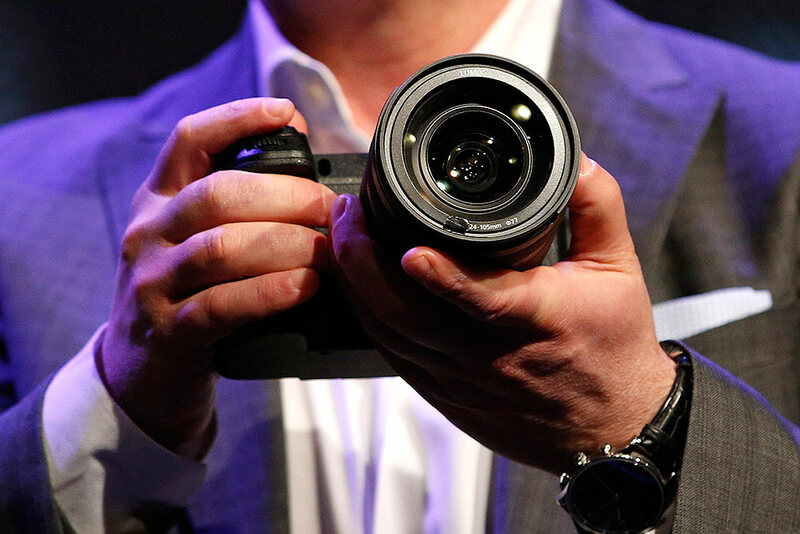 People have their picture taken in the Nikon booth at CES International, in Las Vegas. 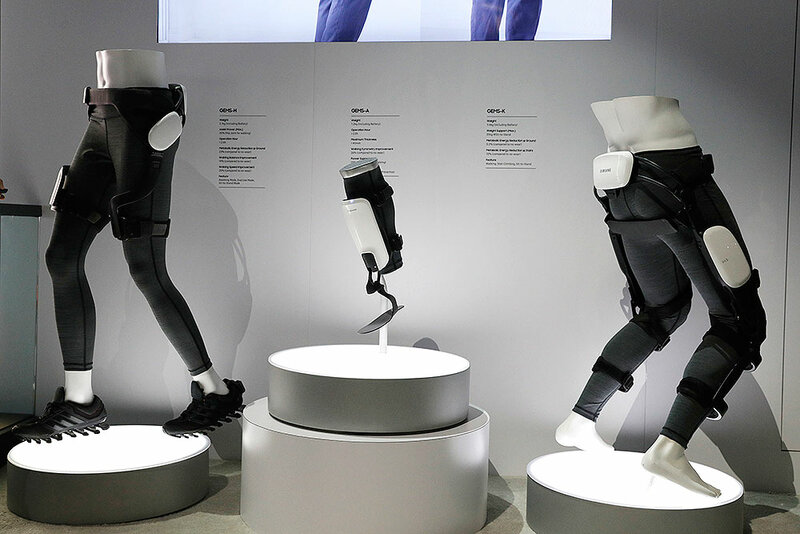 From left, the GEMS-H, GEMS-A and GEMS-K gait enhancing and motivating devices are on display in the Samsung booth at CES International in Las Vegas. 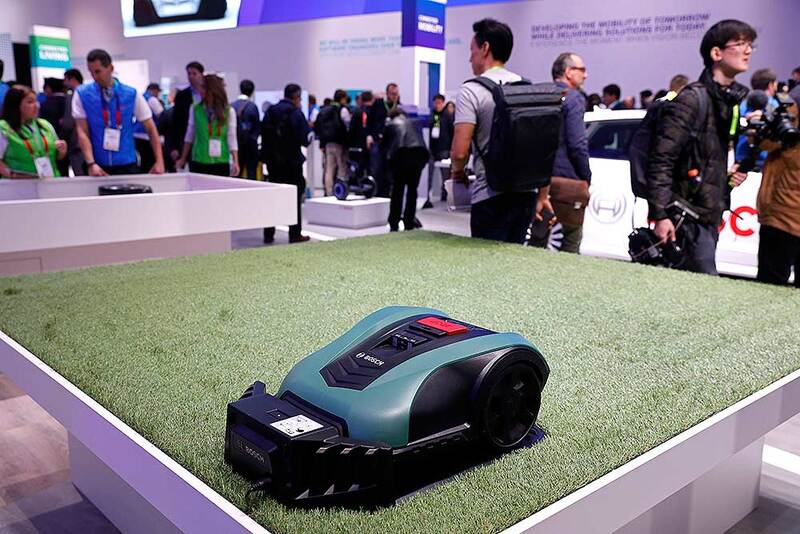 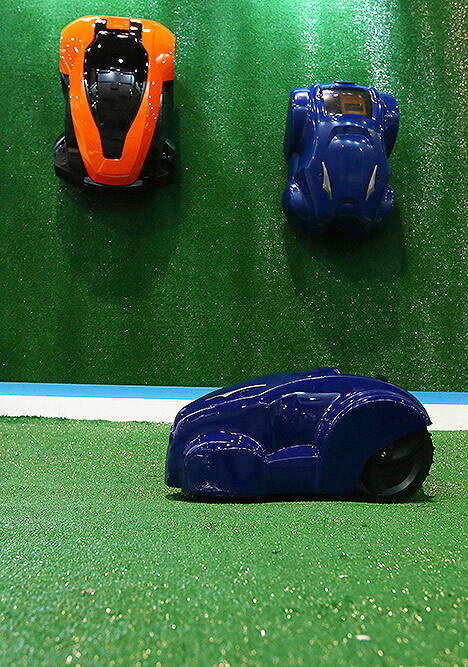 The Indego S+ autonomous lawn mower is on display at the Bosch booth at CES International, in Las Vegas. 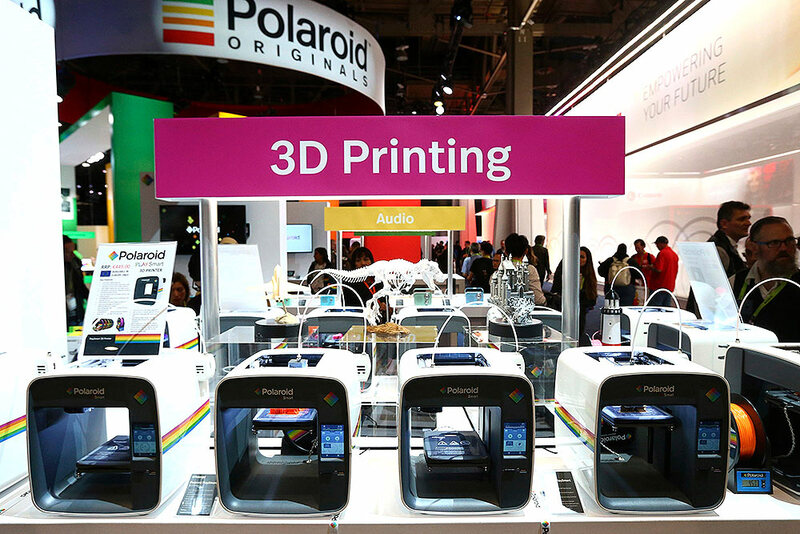 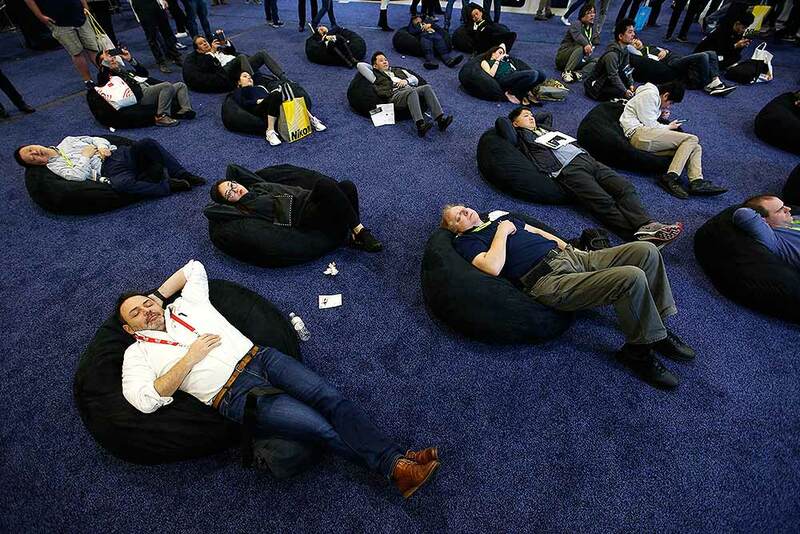 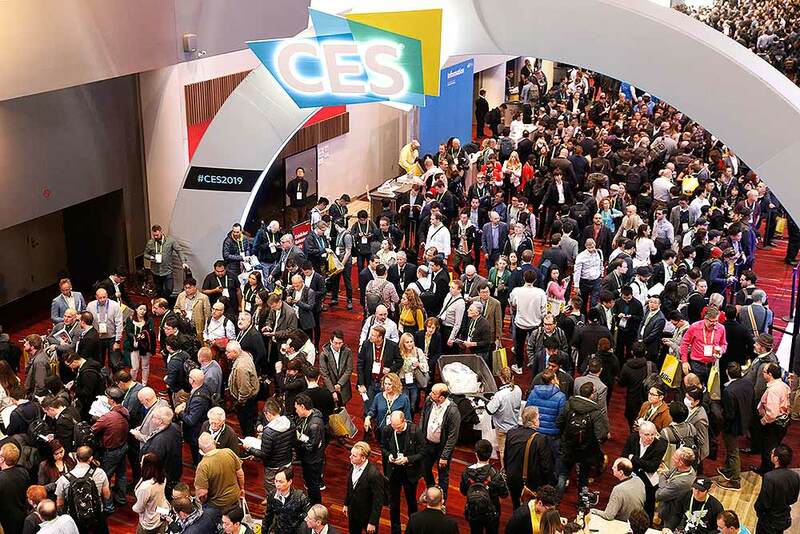 Crowds wait to get on the show floor at CES International, in Las Vegas. 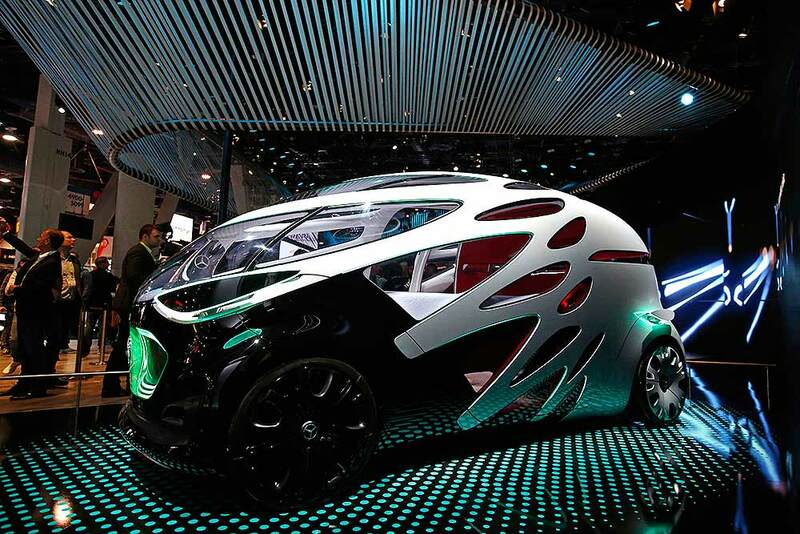 The Mercedes-Benz Vision Urbanetic is on display at the Mercedes-Benz booth at CES International, in Las Vegas. 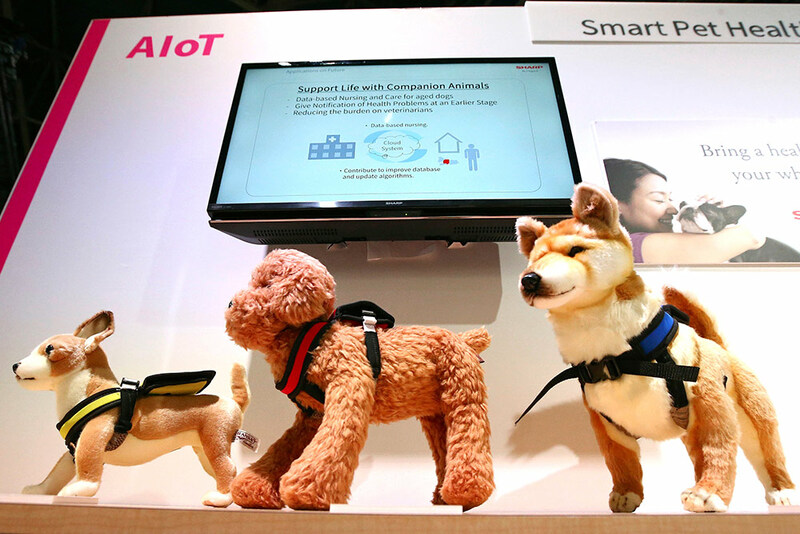 VARRAM has developed a robot to care for your pets while you are away with the VARRAM Pet Fitness Robot, as the company claims this smart device helps with pet anxiety and playtime, offering real-time rewards, like treats, and activities, using the Varram app, you can set a schedule for your pet via Bluetooth, shown at CES International in Las Vegas. 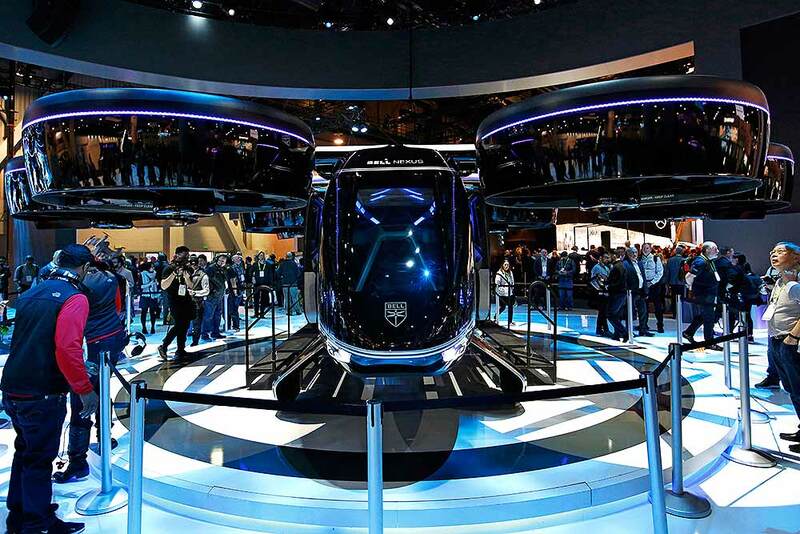 The Bell Nexus hybrid electric air taxi concept is on display at the Bell booth at CES International in Las Vegas. 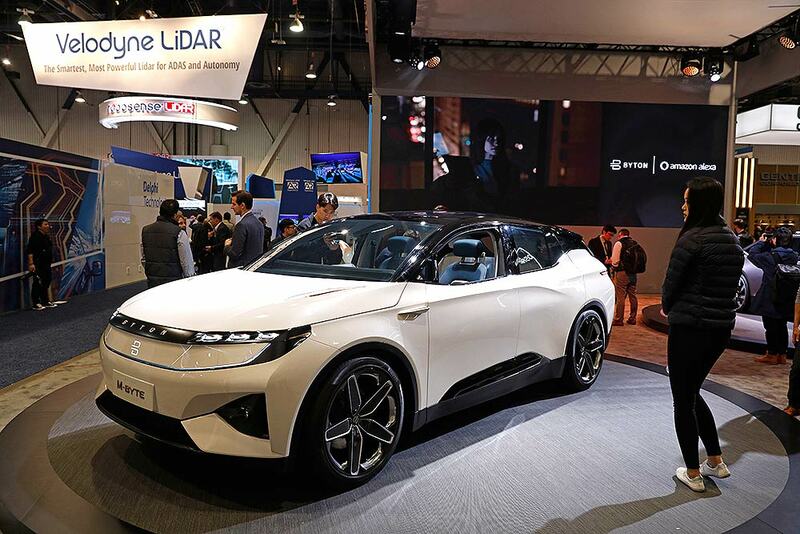 The Byton M-Byte SUV is on display at the Byton booth at CES International in Las Vegas. 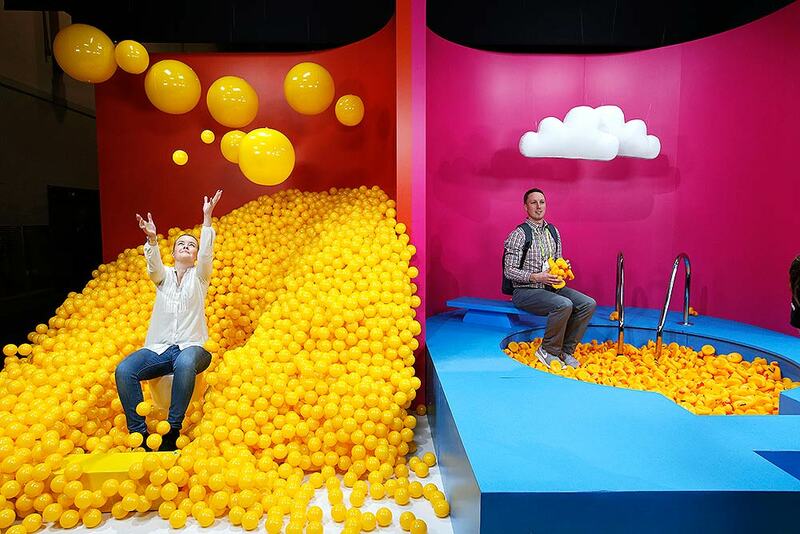 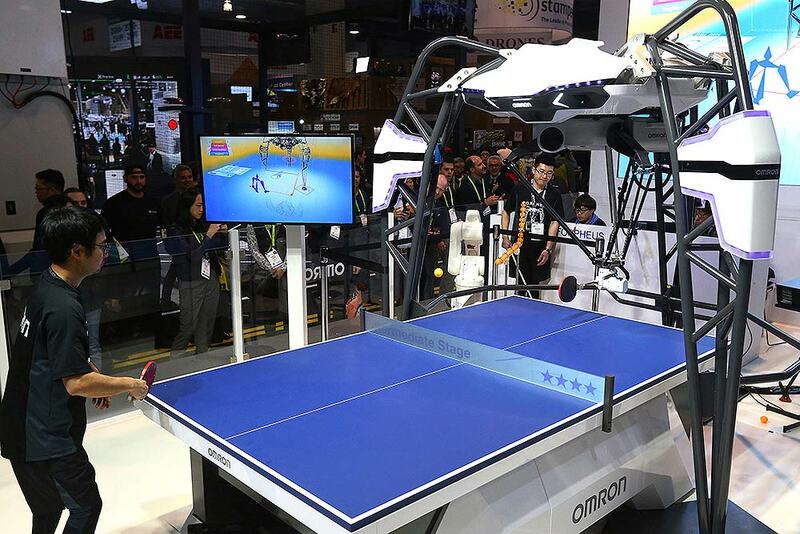 The one-of-a-kind Omron Forpheus plays table tennis against an Omron staffer at CES International, in Las Vegas. 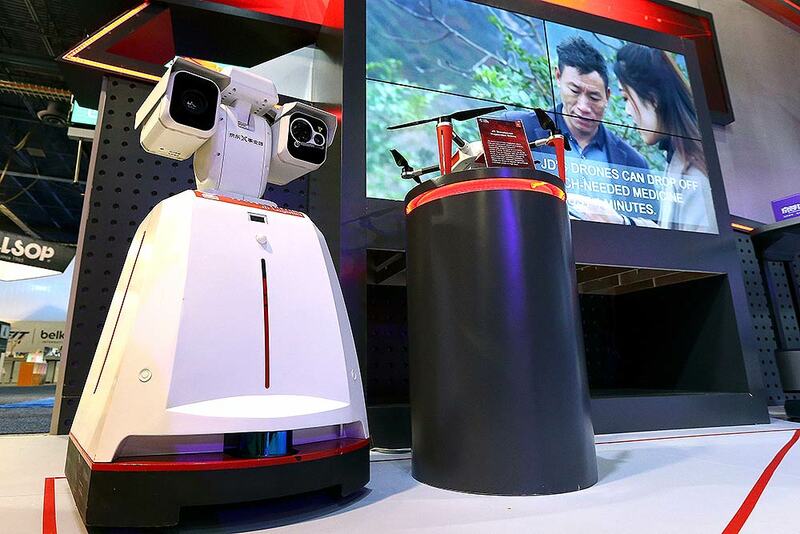 JD.com makes two different automated warehouse inspection drones, shown here at CES International, in Las Vegas. 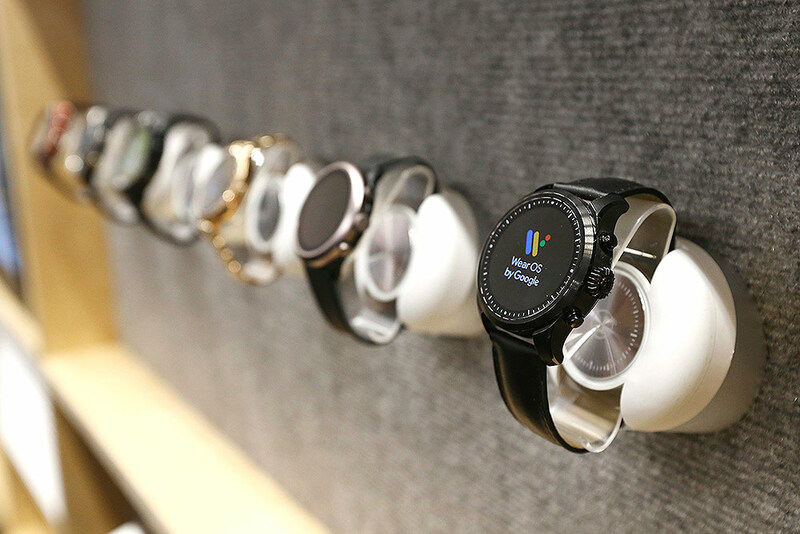 The Google Wear OS watches are on display at CES International, in Las Vegas. 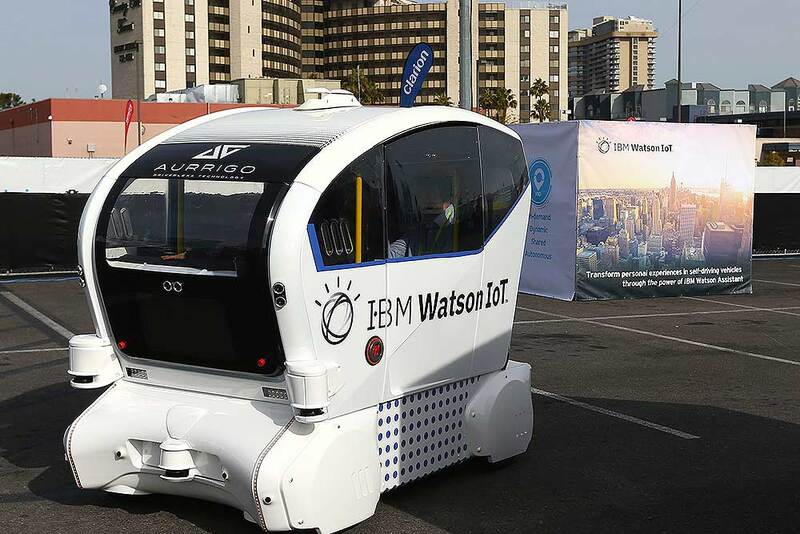 The IBM Watson IoT autonomous pod with Aurrigo Tech is voice-controlled on a closed course at CES International in Las Vegas. 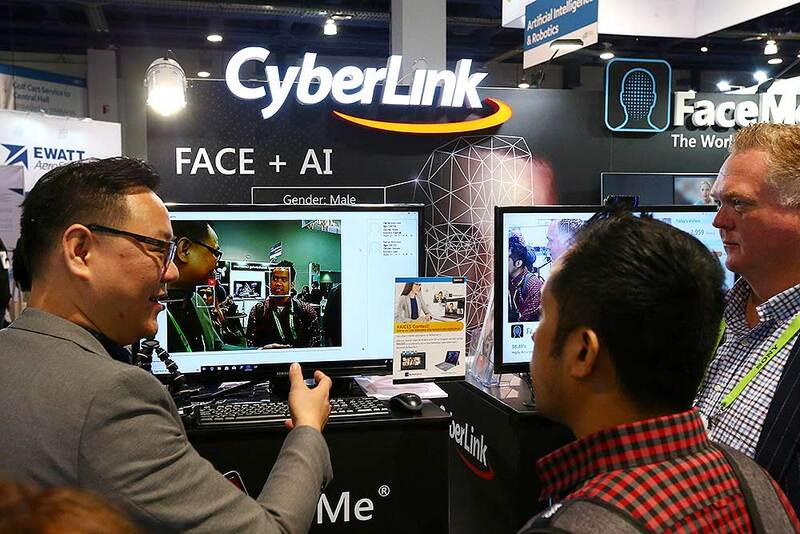 Iris Xuan demonstrates a facial scanner from SK-II, a skin care company, at the Procter & Gamble booth before CES International in Las Vegas. 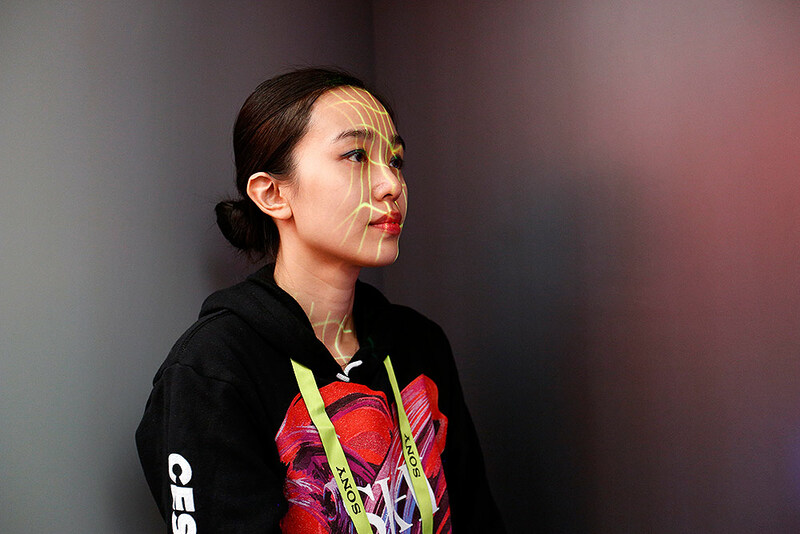 The scanner takes measurements of the user's face to give a "skin age" to help the user pick cosmetic products from the company. 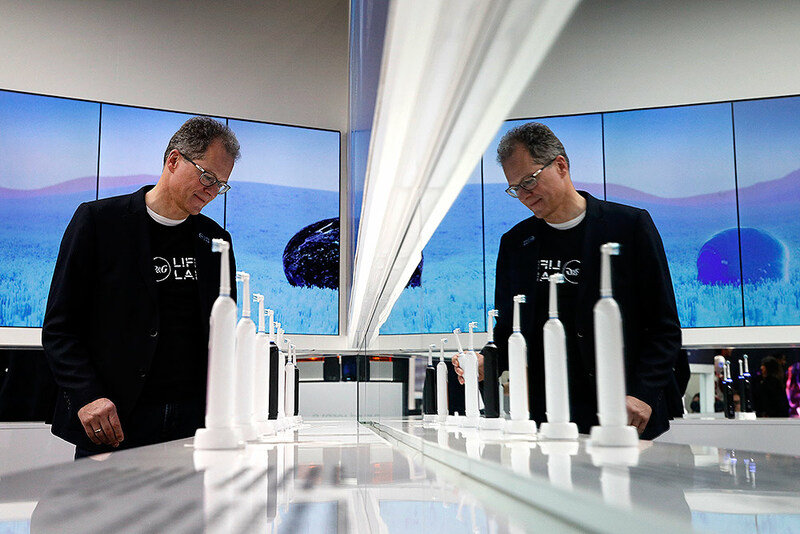 Hansjoerg Reick looks at a display of Oral-B Genius X smart toothbrushes at the Procter & Gamble booth before CES International in Las Vegas. 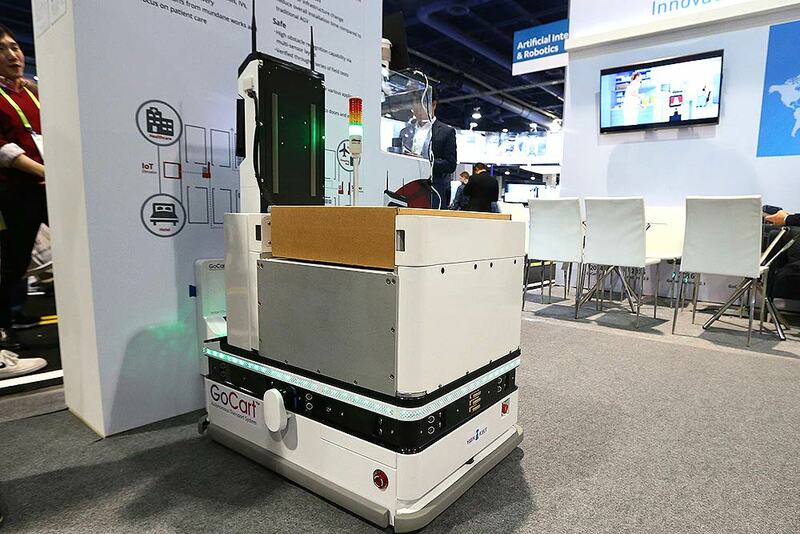 Yoon Lee, senior vice president, Samsung Electronics America, demonstrates the Bot Care robot during a Samsung news conference at CES International, in Las Vegas. 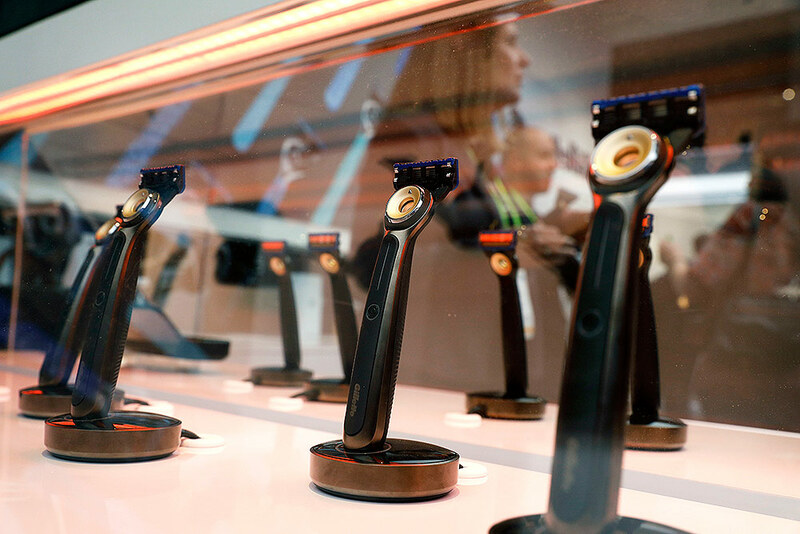 Gillette's Heated Razors are on display at the Procter & Gamble booth before CES International, in Las Vegas. 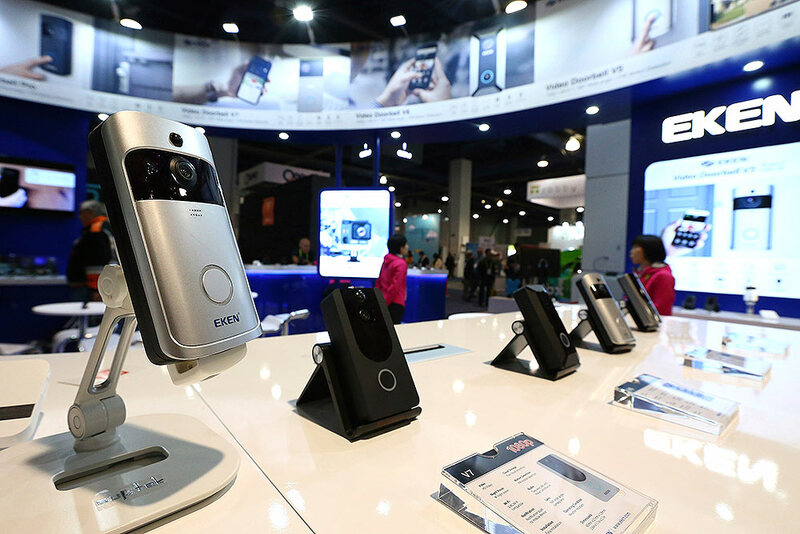 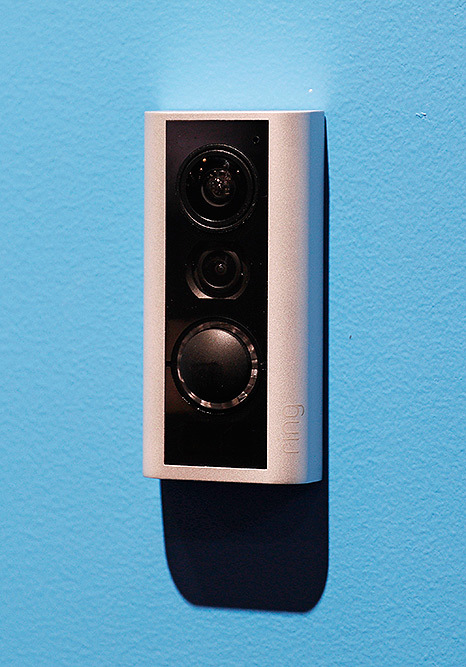 The new Door View Cam is on display at the Ring booth before CES International, in Las Vegas. 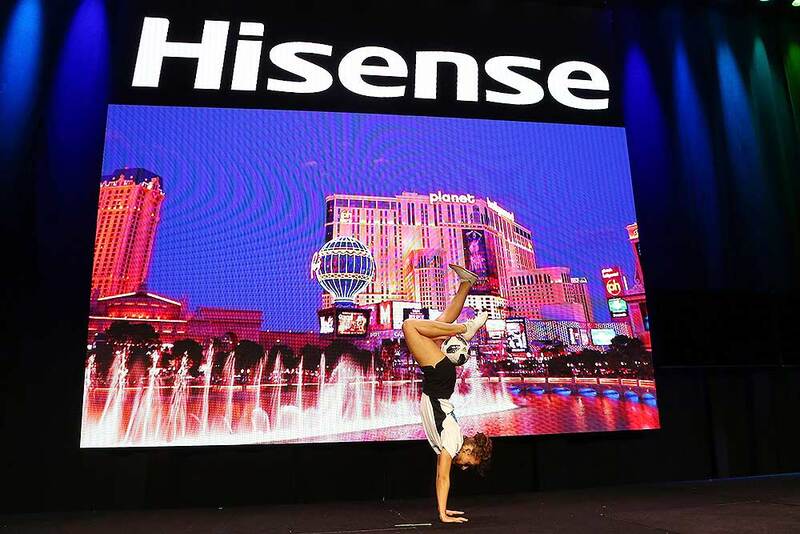 Kitti Szasz, the Hungary freestyle soccer champion, performs at the start of the Hisense news conference at CES International in Las Vegas. 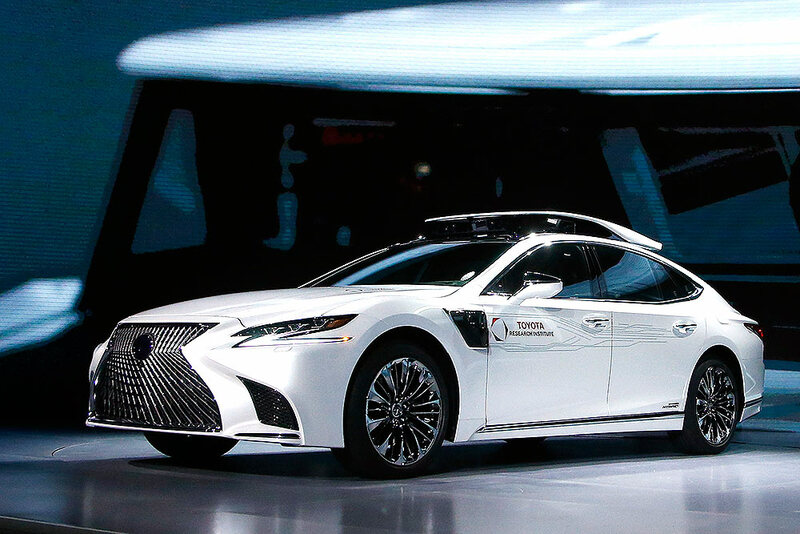 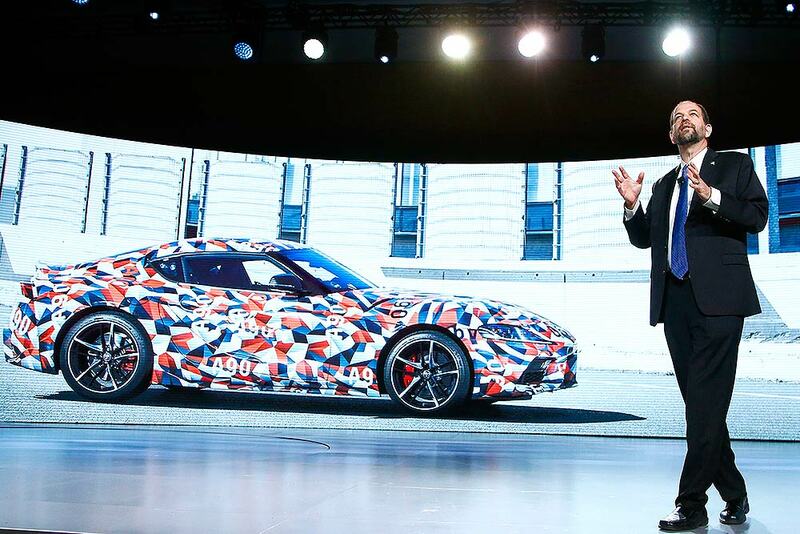 Toyota Research Institute, shows off Toyota's latest autonomous-driving test vehicle, called P4, based on the new-generation Lexus LS500h hybrid luxury sedan, with a roof-mounted assembly with cameras and sensors, and sensors added onto the front fenders, at the Toyota news conference at CES International in Las Vegas. 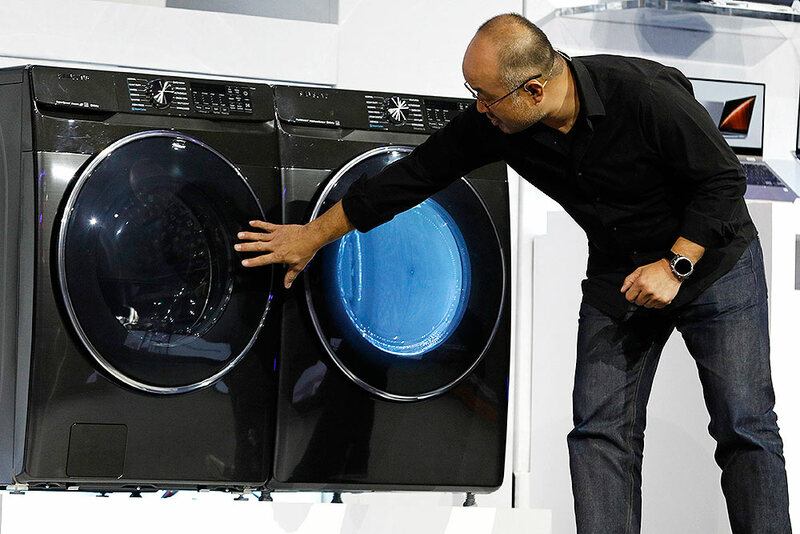 Yoon Lee, senior vice president, Samsung Electronics America, looks at a new front-load washer during a Samsung news conference at CES International in Las Vegas. 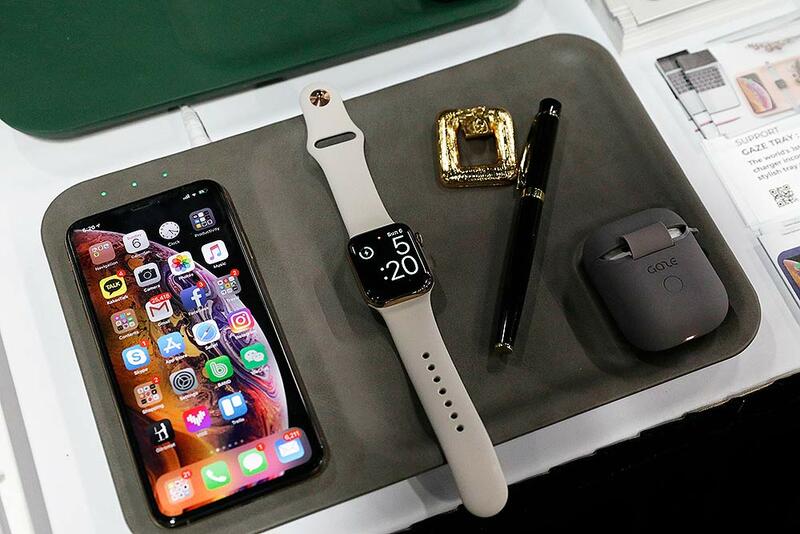 The Archibald e-gardener app, left, and Super Sensor, right, are on display at the Connected Garden booth during CES Unveiled at CES International, in Las Vegas. 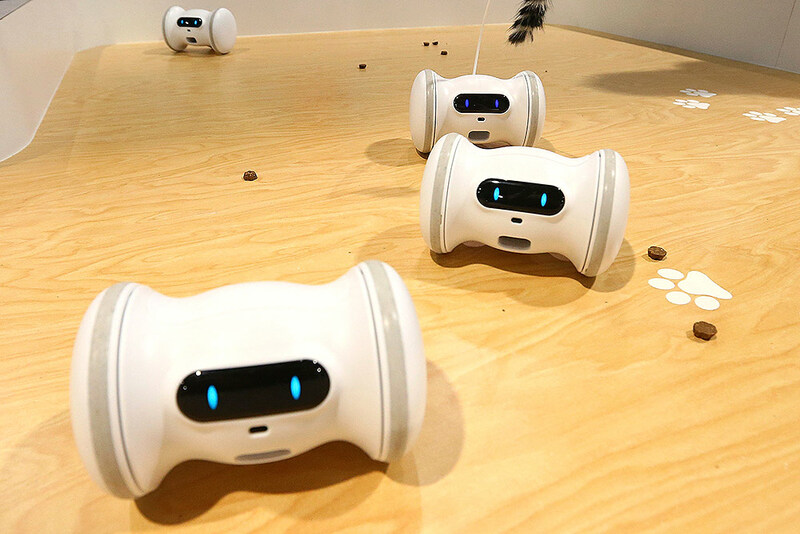 The Super Sensor, over a 24-hour period, can analyze the soil, brightness and climate and recommend types of plants according to preferences. 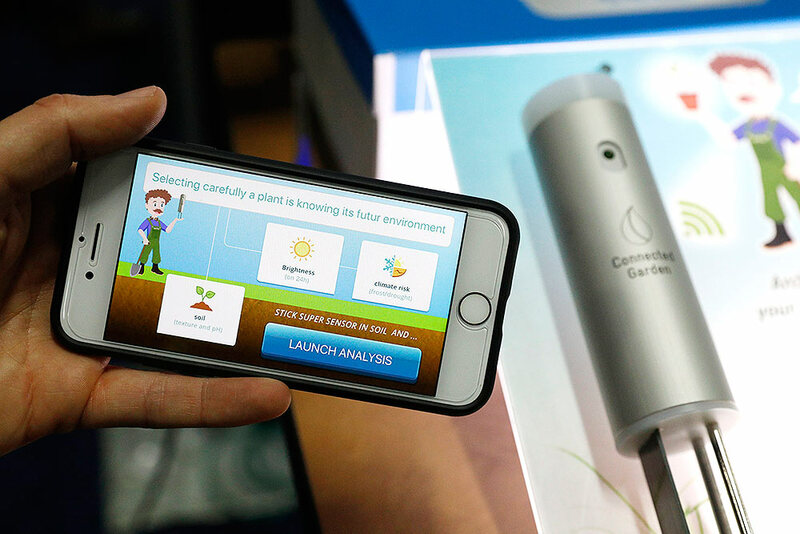 The app has augmented reality and recommends care for specific types of plants. 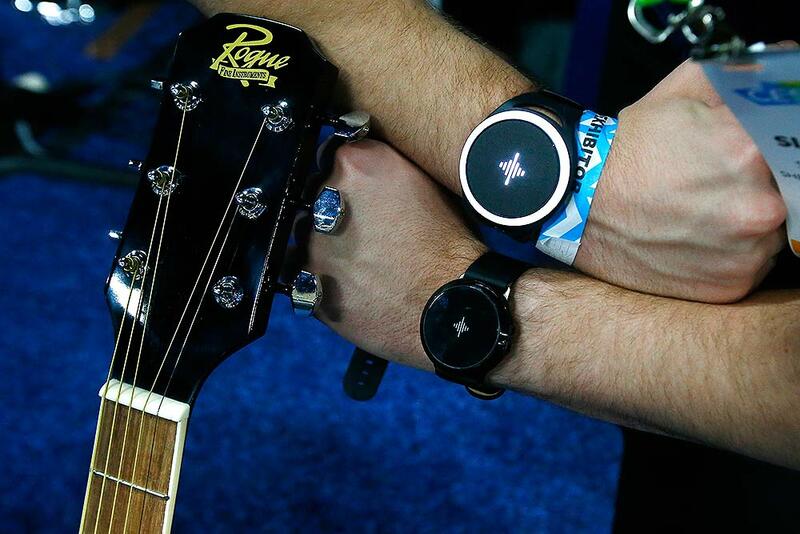 The Soundbrenner Pulse, the top version is a vibrating metronome, with the newer model also being a watch and a guitar tuner, shown here at the CES Unveiled at CES International, in Las Vegas. 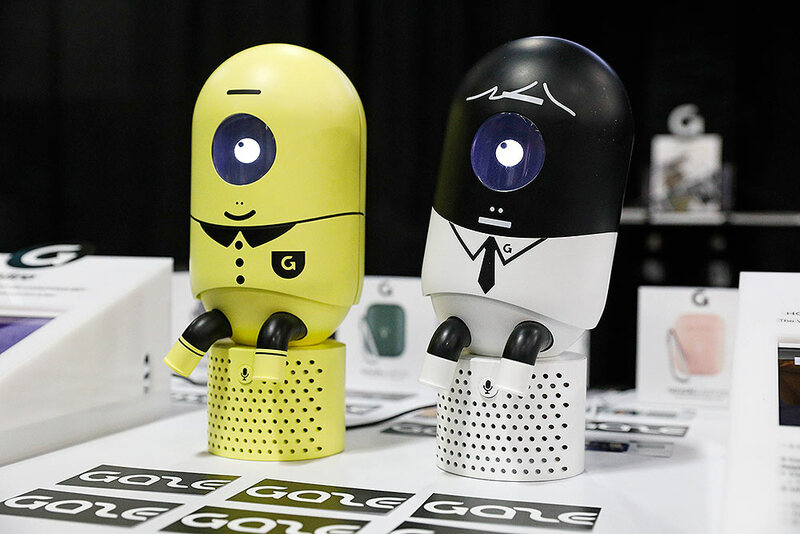 The Giiro posture coaching robot is on display at the Gaze Lab booth during CES Unveiled at CES International, in Las Vegas. 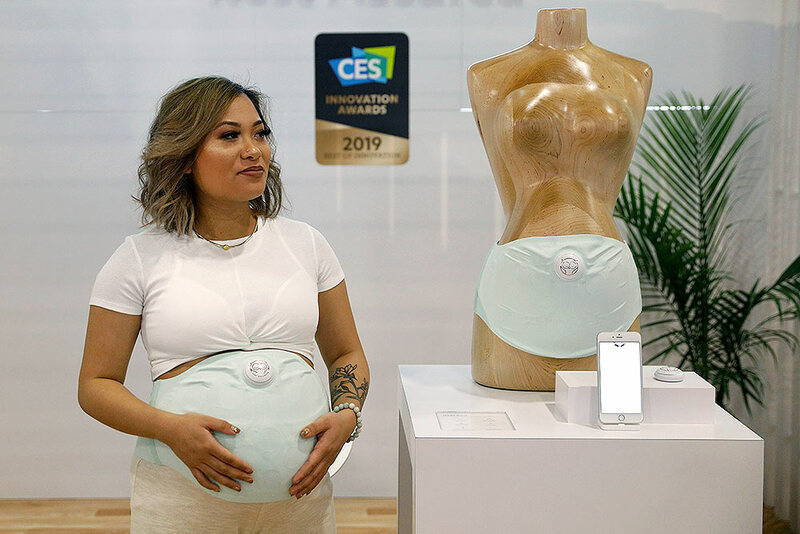 The device uses a pressure sensitive pad to help correct the user's posture. 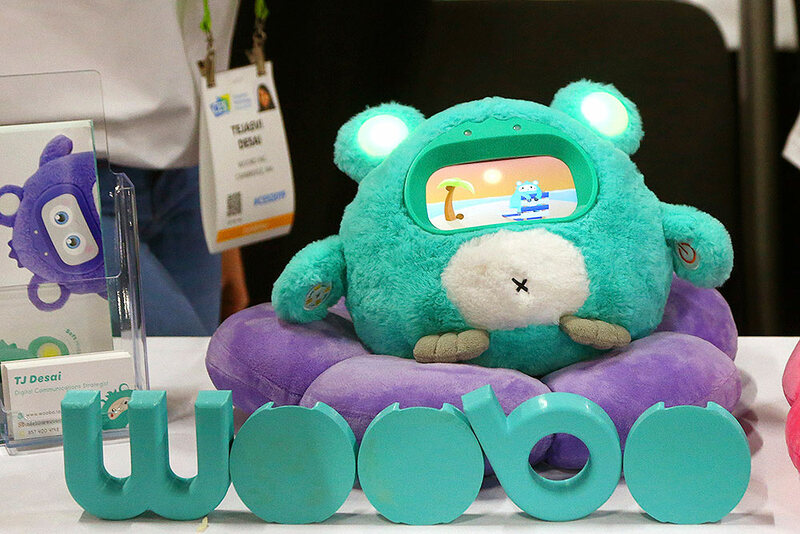 Woobo Inc. displays their stuffed animal interactive companion robots for kids that can answer questions and has other educational content, shown here at the CES Unveiled at CES International, in Las Vegas. 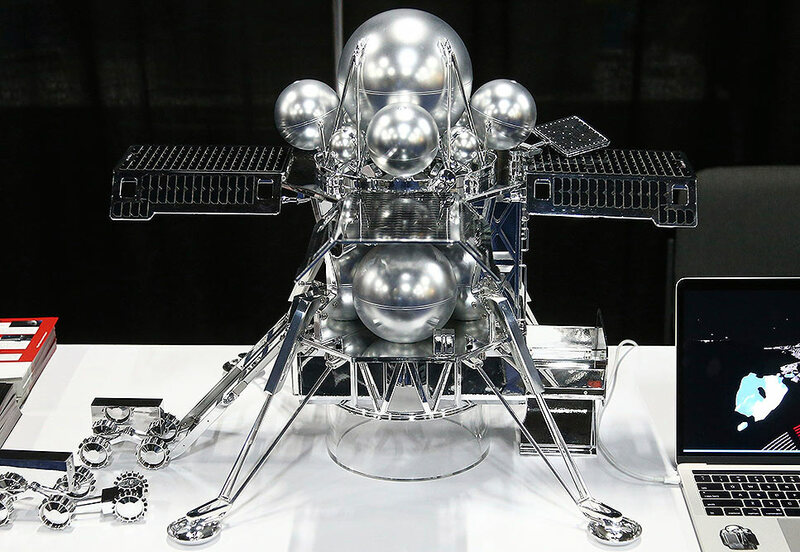 Hakuto-R shows off its lunar lander, which is scheduled to be part of the SpaceX Falcon 9 rocket for a 2020 and 2021 missions, shown here at the CES Unveiled at CES International, in Las Vegas. 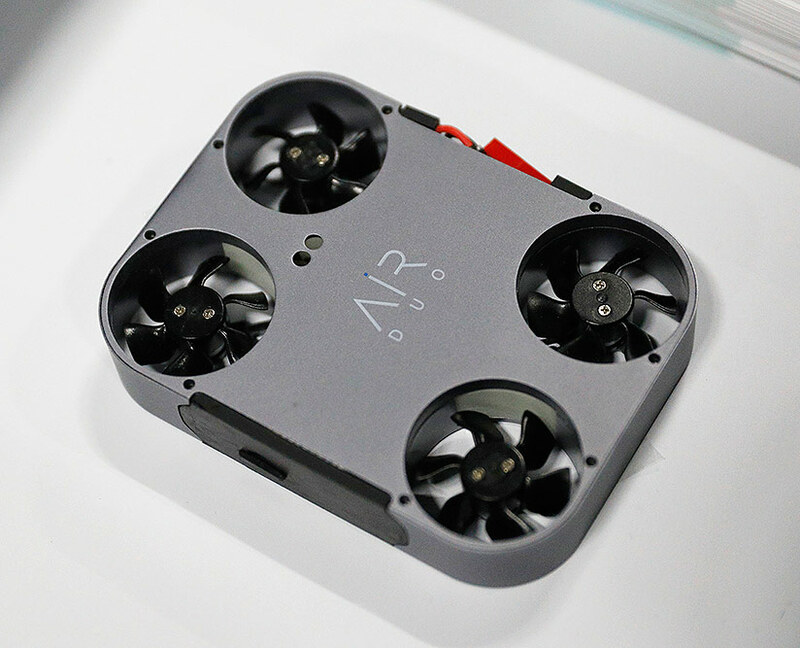 The Air Duo photo and video drone is on display at the Air Selfie booth during CES Unveiled at CES International, in Las Vegas. 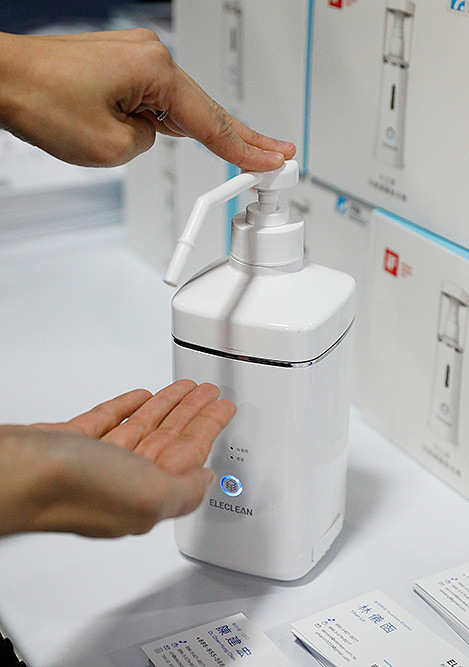 A person demonstrates the Eleclean disinfectant spray at the Eleclean booth during CES Unveiled at CES International, in Las Vegas. 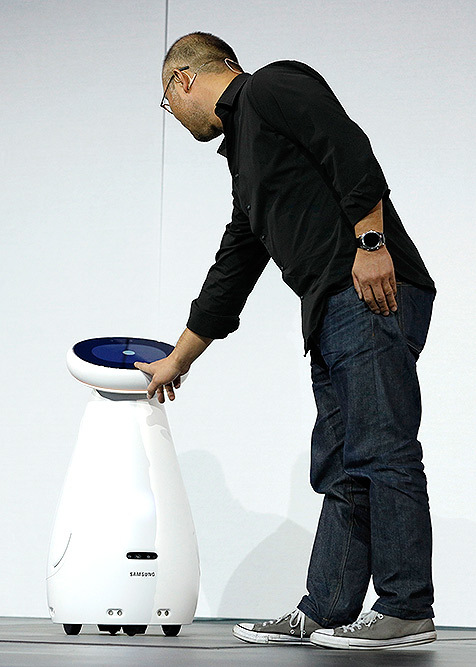 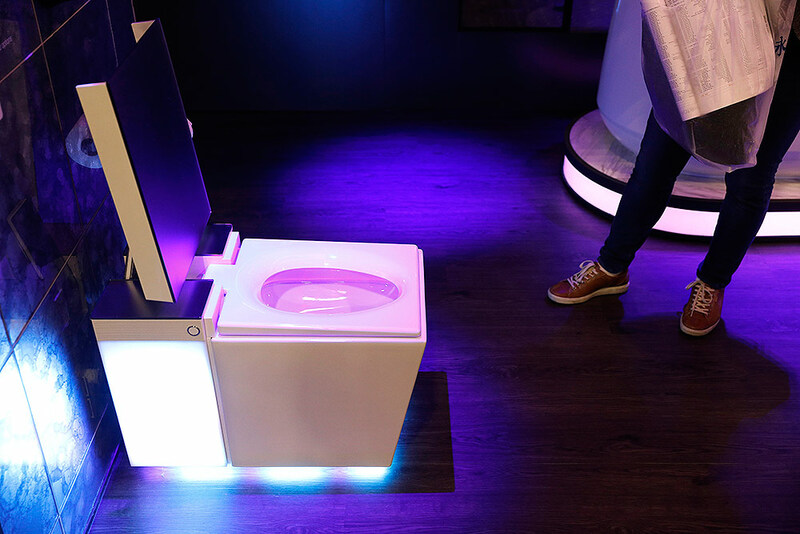 The device uses water to produce a disinfectant. 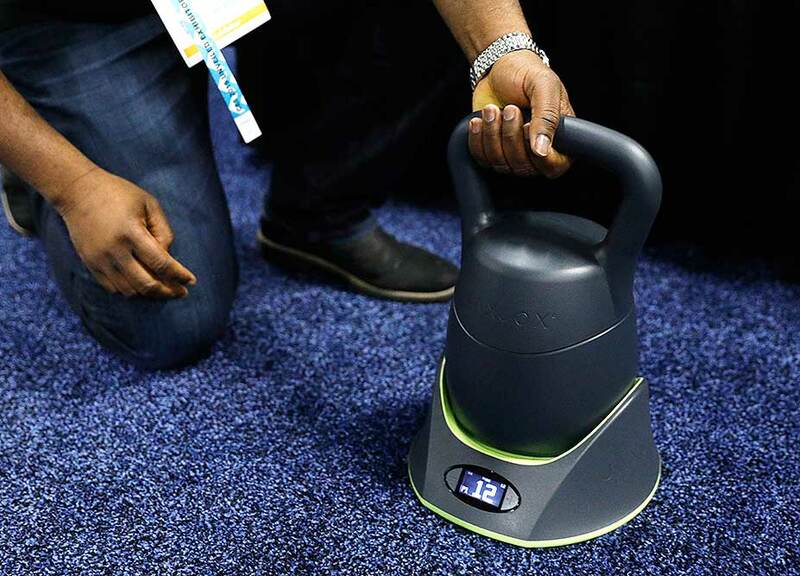 The KettlebellConnect is on display at the Jaxjox booth during CES Unveiled at CES International, in Las Vegas. 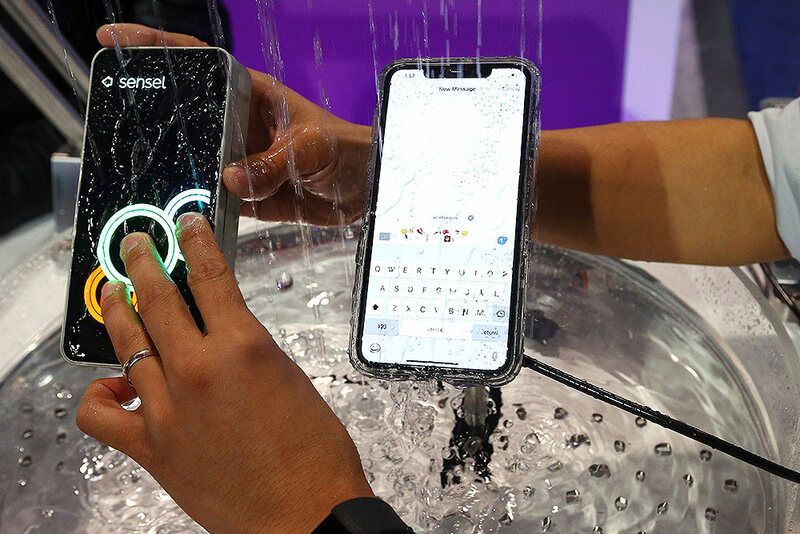 A woman demonstrates the Artemis smart mirror at the CareOS booth during CES Unveiled at CES International, in Las Vegas. 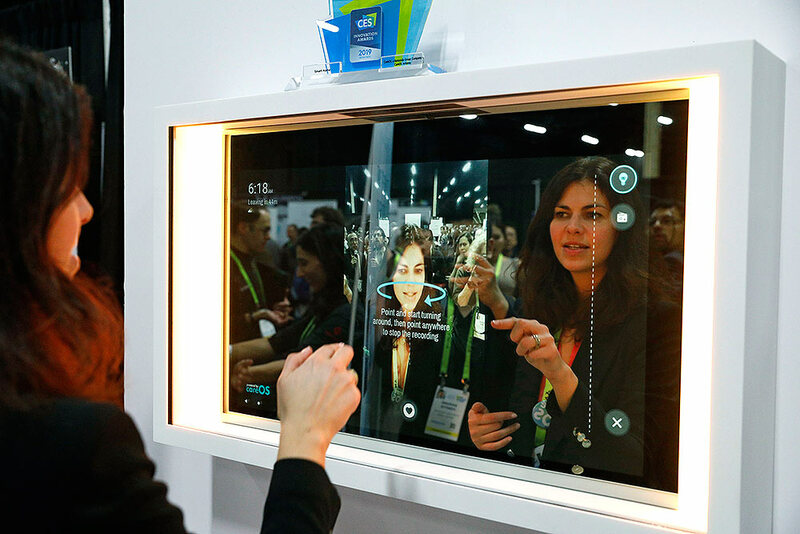 The interactive mirror has video capture, virtual try-ons, facial and object recognition, and can give the user video instruction on specific makeup products, among other things. 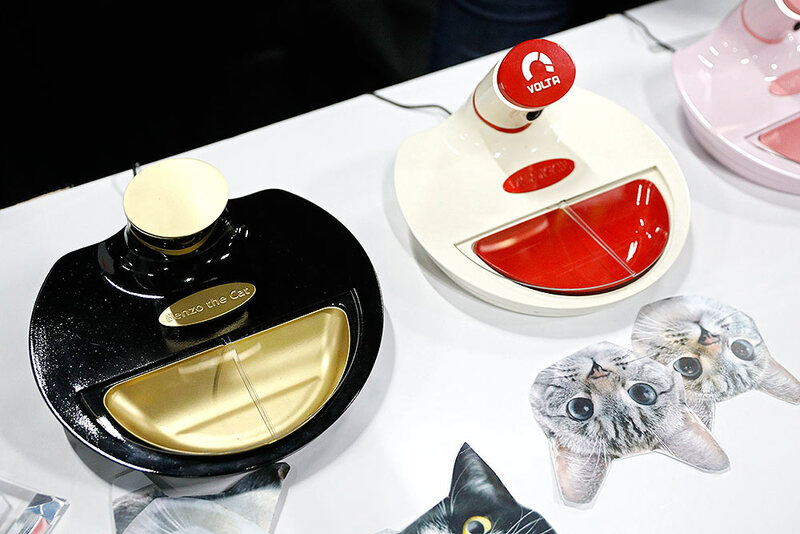 Mookkie pet bowls are on display at the Volta booth during CES Unveiled at CES International, in Las Vegas. 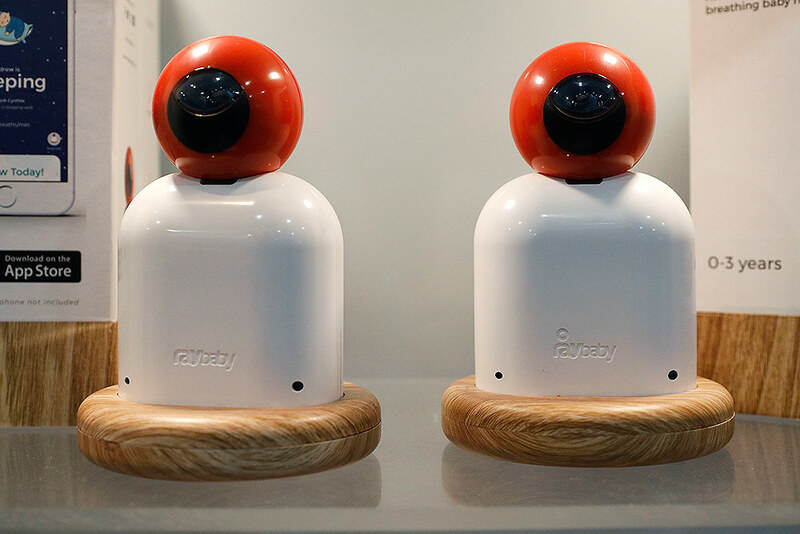 The bowl uses visual recognition and will only open up to a specific cat's face, preventing other cats or animals from eating the food. 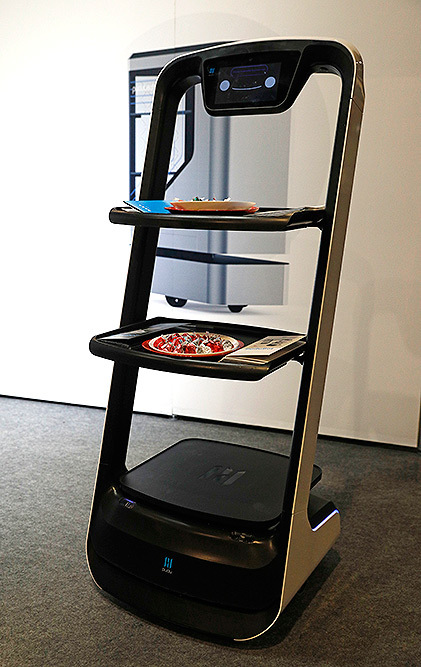 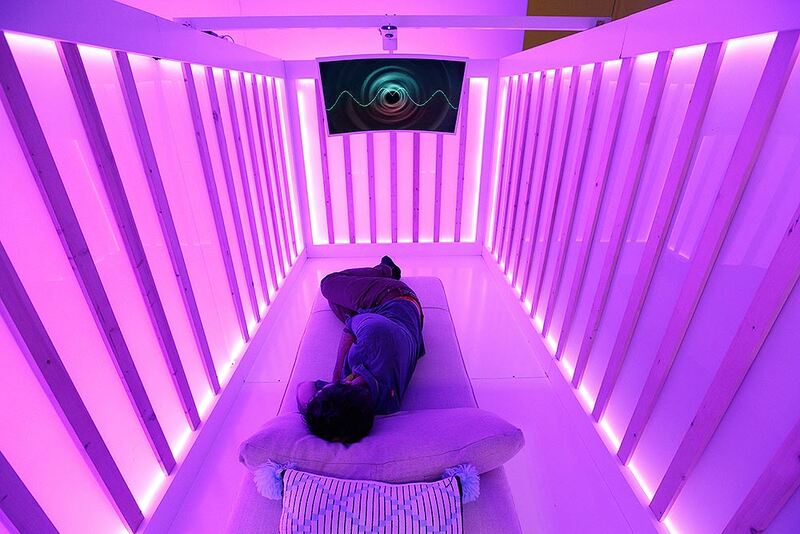 The Gaze Tray is on display at the Gaze Lab booth during CES Unveiled at CES International, in Las Vegas. 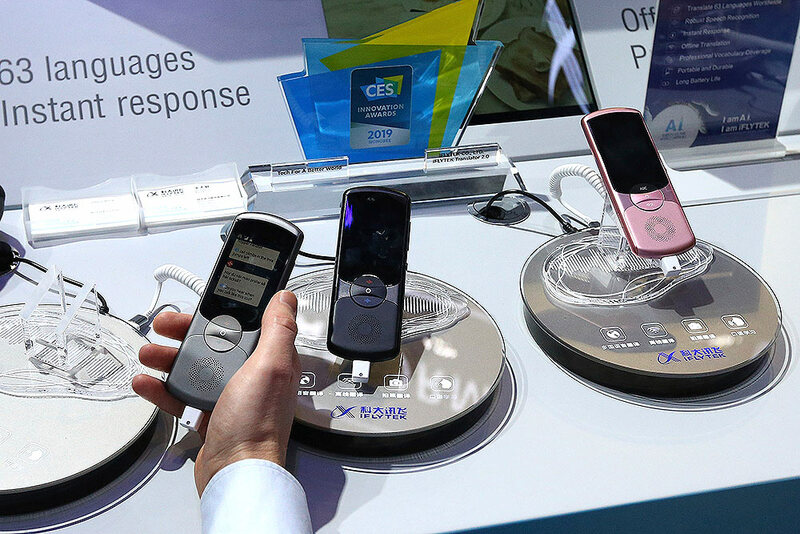 The device can charge several types of devices at once.